INERTIA starts with a silent memorial, remembering those who lost their lives to the atrocities of the Holocaust and the Third Reich. 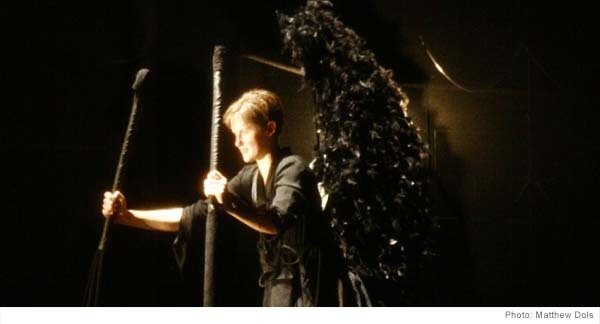 All fourteen performers, dancers and actors, ages 9 through 75, carry candles to the front edge of the stage, then line up against the wall, their backs to the audience. They bow their heads and bend under the weight of Hitler’s voice, an original recording, that permeates the skin and foreshadows the irrevocable consequences and unspeakable horrors that his voice invokes. INERTIA now takes us back to the times of the Hitler Regime. Life was dominated by an ever-growing and overwhelming fear; reality changed and every private matter became public and political affair. Throughout INERTIA, serenity unforgivingly gives way to chaos, ending with mass exterminations in the gas chambers. The angel of death sweeps across the land and leaves but a few survivors. As INERTIA flows from scene to scene, warm, dark, earthy tones are pierced by a cold and sharp starkness; images appear and disappear into darkness and dancers are suspended in mid-air. We see a kinship to the genre of film. Scenes switch back and forth between abstraction and realism, portraying train stations, concentration camps, and streets as well as the innermost private spaces of the mind. INERTIA is not didactic or scholarly. It is a personal account and an emotional response to the terrifying potential of human cruelty. INERTIA is based on an intensive rehearsal process, research, books, photos and our grandparents' and parents' stories. Interviews with Holocaust survivors Bronja Merlin, Miriam Warshauer and Alfred Schnog helped us better understand the reality of those times, though they will forever remain incomprehensible. Endlessly sad images, many of which we all have seen at some point in our lives - in school or on television - are brought to life on stage and thereby placed into the context of reality. The photo of a woman touches us deeply: she is being paraded through the streets by a mob. A handwritten sign around her neck denounces her as a whore, an enemy of the state and a race defiler - in INERTIA we see her standing in front of us. She is real.Countless stories contributed to INERTIA: The husband who never returned from the war and never saw his child; the grandmother who hid in a closet in Amsterdam during a Nazi raid, remaining unharmed, yet the only survivor of a family of a hundred souls; the boy who survived an attempt by neighborhood children to hang him to death; the many whose desire to survive and protect their families outweighed the desire to fight the Nazi Regime, or stand up for a friend or lover; the woman who had been sorted to die and begged for her life; the survivors who still to this day are haunted by what had been done to them; the many who committed betrayal, murder or suicide to escape the future in a concentration camp. INERTIA speaks to all of us with great clarity. Audiences do not need to love or ‘understand’ dance to relate to INERTIA, because the images speak for themselves. While allowing us an insight into the point-of-view of the victims, INERTIA facilitates comprehension of our own potential for cruelty. INERTIA speaks to us independently of nationality, race or religious orientation. Genocide is not a regional problem; it is a human problem. By looking back, we point to our future, reminding us that we must question ourselves, see and understand our strengths and our weaknesses. Amidst all the sadness, INERTIA radiates hope and love for humanity; it creates a strong bond between those in the audience and passionately fosters tolerance and understanding. Inertia was created in residence at the University of North Carolina Wilmington and the University of Nevada Las Vegas. 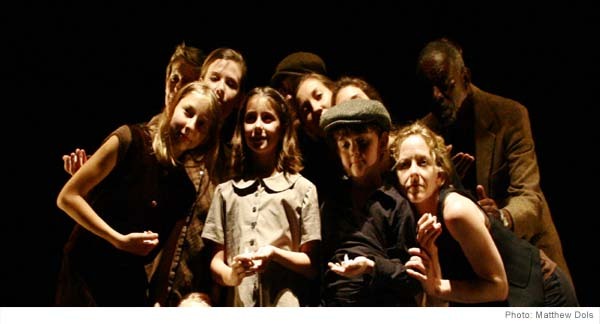 In connection with UNCW's 2008 Holocaust 'Days of Remembrance' INERTIA was premiered on May 3rd, 2008 to standing ovations. 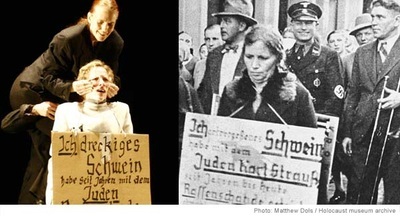 When the University Of North Carolina Wilmington approached me with the commission of a work for the 2008 ‚Holocaust Days of Remembrance’ I was honoured and frightened at the same time. To create such a piece is not an easy task, by far maybe one of the most difficult challenges I could face as a choreographer. I wanted to create a work that touches people deeply and that reminds them of the atrocities that need to be remembered because they stand in direct relationship to our world today. Across the globe, we are still haunted by racism and hatred. Genocide and war are part of our daily lives. I have been fortunate to grow up and live in multicultural and open-minded cities. But I have encountered racism everywhere; the equilibrium is delicate and its conservation needs to remain in our minds. Nothing should be taken for granted and nothing will maintain itself. This concerns all of us, all people, all countries. We have to critically analyze our actions and thoughts and we must nurture the good within us and pass it on to others.